Born August 4th 1947, Schulze initially made his mark as a drummer, first with the group Psy Free, later with Tangerine Dream (he played on their first album "Electronic Meditation" before he quit) and Ash Ra Tempel (with Manuel Göttsching). In 1971 Schulze started a solo career as an electronic musician and released a couple of heavily experimental albums, "Irrlicht" and "Cyborg". 1973's "Cyborg" was the first release where he used a "real" synthesizer, the legendary VCS 3 and later in the 70's he would record albums such as "Moondawn", "Mirage" and "X" and embark on several tours, documented across a number of live albums. In 1978 he set up the label Innovative Communication and the following year he also launched the pseudonym/project Richard Wahnfried. In the 1980's Schulze continued his hectic release schedule as well as recording several soundtracks and rebuilding his studio (he "went digital" in 1986). In summer 1983 Klaus Schulze 'sold' Innovative Communication. In the 1990's Schulze recorded several electronic interpretations of works by classical composers (most notably Wagner) as well as collaborating with opera singers and other classical music performers on his own albums. He also started collaborating with German ambient/techno artist Pete Namlook in the series "The Dark Side Of The Moog" on the latter's Fax label, and steered the Wahnfried project into a more modern techno- and trance-inspired direction. I agree that Schulze is highly overrated. He is a percussionist and I acknowledge his influence in that regard with his electronic implementations of it. But musically, his notes are the same repetitive generic 'spooky' progressions throughout his work. I do happen to like Moondawn and Kontinuum in spite of this, and I think that Moondawn probably had an influence on Kraftwerk in terms of certain electronic sounds and rhythms, but in terms of chordal arrangements, Schulze is not even in the conversation in the German scene. He does not actually compose music in the sense that Edgar Froese, Florian Fricke and Manuel Göttsching do/did. And it is very refreshing to find someone with whom I agree on this. When you strip away the electronica and the percussion/rhythm and are left with merely the musical notes, Schulze comes up seriously wanting at best. Incidentally, one of the most ridiculous rankings I have ever seen is FACT Magazine placing Moondawn at #2 and Tangerine Dream's Phaedra at #49, not to mention all the other marvelous albums that show up in their ranking. Overrated indeed!! 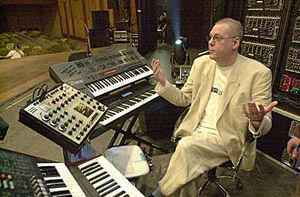 Klaus Schulze is genius and wizard of electronic music. To explore his works is an interesting quest. As he used to say in the first 10 minutes of his composotions he creates his listener and only after that the interesting things are starting. So you have to be thoughtful listener and his music will work for you. Sometimes it works from the second or from the third, fourth listening. If it doesn't - simply try other album. Klaus Schulze recorded a lot of them. "Mirage", "Timewind", "Body Love", "Dune" (with Arthur Brown), "X", "Dig It", "Kontinuum" - long imaginary landscapes of thoughts and rhythms. "Freindship", "In Blue" are collaborations with Manuel Göttsching (Ashra). And by the way don't forget to listen to the albums by Ash Ra Tempel. And it's different music. "Farscape", "Rheingold", "Big in Europe" are albums with completely improvised singing by Lisa Gerrard (Dead Can Dance) - and it's other kind of music. Light relaxing comfortable chill-out music of "Cocooning" and "Privée" (Contemporary Works). And it's not all turns on his artistic way. Even not the half of all turns. You should be prepared for disilussions (what's to like here?) and for the openings (wow!). His works wouldn't remind you of the style of other wizards of classical electronic music from the 70's 80's - Jarre, Vangelis, Michel Huygen (Neuronium), Zanov. It's different approach. He is a kind of Columbus who tried to open way to India and China but instead of it he find the way to different interesting and strange places. And you will follow him in his expeditions. Start to listen with "Crystal Lake" from "Mirage" - this music is keeping the secret of life and death. completely agree with "ttooyyss". Klaus Schulze = most overrated artist musicwise. the same, uninspired chords, melodies all over. The pressing quality and the sound of the 2017 releases are good, but the reproduction of the cover artwork are bad and in the case of "irrlicht" it´s just the cover of the 2nd release from the 70´s and not the artwork from the 1st press. The pictures are blurred and pixelated. The good thing are the download card. But i think, it´s a lost chance to re-release a lot of magnificent albums from the legenday Klaus Schulze. mhiraldo, we are obviously dealing with questions of taste here. For example, I consider much of Vangelis' and Tomita's work to be quite cheesy, but Schulze' big detractor on this thread seems to think that these people are superior to Schulze in every way. I dislike categorical pronouncements of any sort, and I think that Schulze's chief fault (aided and abetted by his manager Klaus Mueller) is his inability to edit himself. Consequently, there's a lot of Schulze material available which is extremely boring and predictable -- like (as several critics have observed) he has flipped the automatic pilot switch. But then again, I find his best work, early and recent, to be exquisitely beautiful. So for the less than serious Schulze listener, it can be a question of what he/she has been exposed to. Klaus Schulze is a phenomenon. Just listen to his debut IRRLICHT - without any Synthesizer he created everything known today as "ambient" or "drone". Long before Brian Eno even thought about such soundscapes. Schulze made his mark all along the Electronic Music timeline, call it Berlin School, Ambient, Trance or Chillout. Tell me anyone, who "invented" a "new" electronic style...I name you an even earlier Schulze album with that music already explored. "Ah, the master has done it again. I firmly believe that Klaus Schulze is as important to electronic music as BACH or MOZART were to classical music"
July 1984, "Synthetic Pleasure, USA"
The fact that there is only one comment here and it being negative about the great Klaus Schulze should tell you a little bit about this site's demographic and user base. Now just head to a release by Drexciya, Jeff Mills, Aphex Twin, Basic Channels, and so on... and read people drooling about how amazing some of these overrated producers are. You also find users fighting like little kids over who started techno and all that nonsense. I guess it makes them happy to think that their favorite artist was the one who started it all. Personally I don't consider myself a fan of any particular artist (Klaus Schulze included), I am only a fan of good music regardless of who is behind it. Unfortunately fanboys usually fail to admit when their favorite artist does a poor job, they somehow feel obligated to defend. However, the more music you listen to it becomes easier to separate true talents from the untalented and calling KS "untalented pioneer" is simply laughable. Like so many prolific artists KS discography includes highs and lows; despite that his overall influence on the evolution of electronic music is essential. Although a lot of wanna be producers have tried, there are only a handful out there (KS included) that can make a 30min+ track so enjoyable and worth listening to again and again. For god's sake, producers of today can barely make a 3min track enjoyable. Now if you want to go back and find origins of say ambient, electro, techno or trance, you might as well put KS on top of your list. The sounds this guy was making during his late 70s/early 80s period have so many trademarks of what trance music should be and that is "putting you in a state of trance". Yes, it's not club trance with beats and all that but it certainly is a precursor to the hypnotic and spacey trance sounds of early 90's picked up by the likes of Dance 2 Trance and others. Is it a surprise then that even the Trancemaster 4 compilation from 1993 included "Druck", a track composed by KS 22 years before this compilation came out? With that said, here's my little recommendation for those who want a good taste of Berlin School of music and KS for that matter, check out some of these albums, the tracks inside brackets are personal picks and the ones that get a solid 5/5 from me. This is merely a teaser compared to Klaus Schulze's overall output throughout the years.